The IP-6600 is an industrial rated router featuring two serial ports and two ethernet LAN ports. Since each Ethernet and serial port is independent, the router has many uses in addition to the commonly used dial-in, dial-out and asynchronous LAN connection modes. 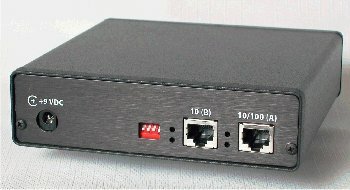 It is commonly used as an easily configured stand-alone firewall router using NAT, port filtering, and address filtering. 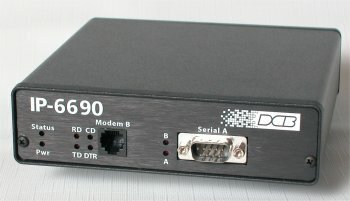 The IP-6600 works well with DSL, cable or dial modems, leased line modems, CDPD or GSM modems, wireless links, satellite modems, the DCB DA-56 DSU, or even simple line drivers. Flexibility is the key. Routing may be configured between any combination of interfaces with full-featured port or address filtering, port forwarding, and NAT. The same port may even be configured for dial-out using dial-on-demand while accepting dial-in calls from portable computer users. It’s easily configured for “stay-online” dial connections. Configuration is quick and easy using a web browser. The router uses three different configurations: a stored configuration, a working (running) configuration, and a pending configuration. This method allows temporary configuration changes, testing, and remote configuration changes even via a PPP link on the router. Configurations may be saved on a PC for later use, and the config file is editable on a PC. On-board tools make network monitoring and troubleshooting convenient. Tools include a packet header sniffer, traceroute, ping, and dial tools (force a dial, force a disconnect). Logging may be configured as standard or with extreme details showing negotiations, modem responses, etc. . The APS-01 remote AC power control easily integrates with the IP-6600. Remotely power up, down, and reboot remote equipment using the IP-6600 management web interface by plugging the APS-01 into the second serial port. The IP-6600 is straight-forward, easy to configure and maintain. The IP-6600 has the features you want without the complexity.